Games are played once a month, usually on the last Sunday of the month. If you plan to attend, you need to register (use form below↓↓). Teams will consist of 2 players each and at least 4 players will be needed . Attendees are asked to bring picnic fare, beverages & chairs. Linda and Luc Chasleries will be setting up the tables and providing cooler, ice, cups, & food tent covers. As early as the 6th century BC the ancient Greeks are recorded to have played a game of tossing coins, then flat stones and later stone balls, called spheristics. The ancient Romans modified the game by adding a target that had to be reached as closely as possible and this variation was brought to France by Roman soldiers and sailors. After the Romans, the stone balls were replaced by wooden balls and in the Middle Ages, it was referred to as Globurum, but became commonly known as Boules (i.e. 'balls'). In the 14th century, Charles IV and Charles V of France forbade the sport to commoners and this ban was only lifted in the 17th century. 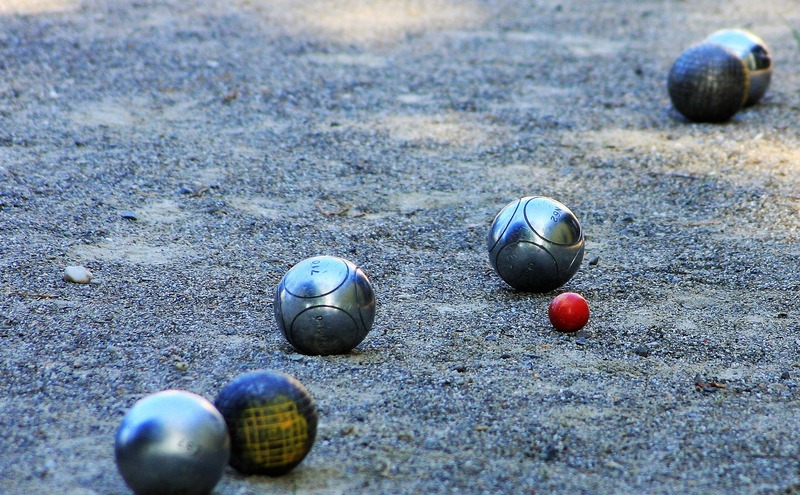 By the 19th century, in England the game had become "bowls" or "lawn bowling", but in France the game evolved into jeu procencal, similar to today's petanque, except the length of the playing area was longer and players ran three steps before throwing. The current form of Petanque originated in 1907 in La Ciotat, in Provence, France in what is now called the Jules Lenoir Boulodrome. It was invented by Ernest Pitiot, a local cafe owner, to accommodate a French jeu provencal player named Jules Lenoir, whose rheumatism prevented him from running before he threw the ball. In the new game, the length of the pitch or field was reduced by roughly half, and a player no longer engaged in a run-up while throwing a ball, but stood, stationary, in a circle. The first petanque tournament with the new rules was organized in 1910 by the brothers Ernest and Joseph Pitiot. 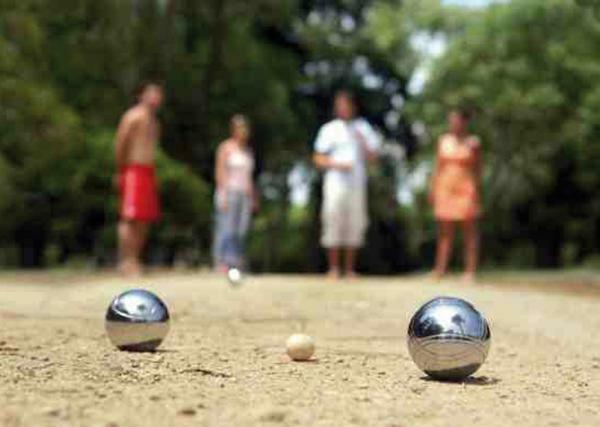 After that the game spread quickly and soon became the most popular form of boules in France. Before the mid 1800s, European boules games were played with solid wooden balls, usually made from boxwood root, a very hard wood. The late 1800s saw the introduction of cheap mass-manufactured nails, and wooden boules gradually began to be covered with nails, producing boules cloutées ("nailed boules"). After World War I, cannonball manufacturing technology was adapted to allow the manufacture of hollow, all metal boules. The first all-metal boule, la Boule Integrale, was introduced in the mid-1920s by Paul Courtieu. The Integrale was cast in a single piece from a bronze-aluminum alloy. Shortly thereafter Jean Blanc invented a process of manufacturing steel boules by stamping two steel blanks into hemispheres and then welding the two hemispheres together to create a boule. With this technological advance, hollow all-metal balls rapidly became the norm. Pétanque is played by two, four or six people in two teams, or players can compete as individuals in casual play. A person may throw two or three boules (balls) as selected by the players. The smaller ball is called the Cochonnet in standard French, Petit Cochon in Cajun French, and the Jack in English. 1. Person No. 1 throws the jack or the Cochonnet about 6 meters from an 18 inch circle at one end of the court. 2, Person No. 1 throws one of his boules trying to get close to the Petit Cochon. 3. Person No. 2 throws one of his boules trying to get closer to the Petit Cochon. There are several options: get closer, knock the opposing players boules out of the way, or knock the Petit Cochon away from the opponent. 4. Whenever a person throws and does not get closer to the Petit Cochon, then he may play until he has no boules. 5. When all boules have been thrown, then the round is scored. The first person to 13 wins. In casual play, the game may be played to 7, 11, or 13.